9.32 mi. ; from WV Border north to MD 135, Mountain Lake Park. MD 562 · Troyer Rd., Old York Rd. 1.39 mi. ; from MD 138 south to end of state maintenance at Markoe Rd. Along with MD 439, another numbered portion of Old York Rd. No longer assigned (decommissioned), entire route now part of MD 224. 6.73 mi. ; from MD 450, Lanham east to MD 197, Bowie. Once ended at olf MD 197 in Bowie, but extended east to new 197 along Race Track Rd. Circa 1957, this route was called Lanham-Bowie Rd. MD 564A: Chestnut Ave 0.06 mi. ; from MD 564 (Chestnut & 9th) north to end of maintenance. MD 564B: Chestnut Ave 0.04 mi. ; from road end south to MD 564 (Chestnut & 11th). MD 564C: 11th St 0.02 mi. ; from MD 564 west to MD 564B (Chestnut & 11th). from Maple Ave, Trappe north. to Lee Terrace, Easton in 3 sections. MD 565 shown on a 1958 map. MD 565 is a catch-all number for old 50 south of Easton, much the same way as MD 662 to the north. At one time encompassed all of Washington St in Easton, but now only consists of a small stub off of MD 322. Mileage table is from north to south, though this means the suffixed 565A goes first. MD 565: Main St (Trappe), Easton-Trappe Rd 5.18 mi. ; from Maple Ave & Main St in Trappe north to US 50 south of Easton. MD 565A: S Washington St (Easton) 0.58 mi. ; from MD 322 north to and of state maintenance at Lee Terrace. MD 565B: (no name) 0.18 mi. ; from MD 565 north to road end. 1.19 mi. ; from MD 292 east to MD 298.
from beginning of state maintenance east to Manor Rd. No longer assigned (decommissioned 1999). This was a 'floating' route, never touching any other route. It never did extend west to I-695 Exit 29, but instead ended further east at an indeterminate point. MD 567 was likely dropped in 1999 along with MD 20 and MD 718, in exchange for the addition of Merritt Blvd to SHA maintenance as MD 157. MD 567, facing west (signed southbound), just past Satyr Hill Rd, 1998. It would be decommissioned within a year. 0.41 mi. ; from MD 367 north to Delaware border. Finally signed in 2011, after having been in the system as far back as maps depict (1927), probably as part of MD 368, which appears on the first detailed map of 1938. MD 568 was first used for the part of current 367 east of it. The current arrangement of routes first appears on the 1950 official map, but this may have been due to the new map style that year. Becomes Delaware Road 397 at the border. from MD 97 northeast to end of state maintenance. 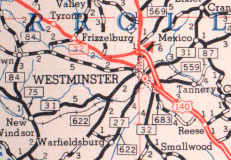 Westminster area routes, including MD 569 (upper right), shown on a 1955 SRC map. MD 570 consisted of some bits and pieces of road in southern Carroll County. By 1958, 570 became a section of the 2-part MD 97, which was subsequently linked. MD 570, shown on the 1948 SRC map. north off US 15 to Pennsylvania line. MD 571 dated as far back as 1937. MD 571, shown on the 1948 SRC map. from MD 67 east to Washington-Frederick County line. Ends at Crampton's Gap, along the ridgetop of South Mountain and the Appalachian Trail. This was also the site of the first major fighting in the Civil War in Maryland, on September 14, 1862. At the ridgetop is a monument to Civil War correspondents. from approx. Collins Ave north to indeterminate point. MD 573, shown on the 1948 SRC map. northeast off MD 235 to road end. No longer assigned (decommissioned 1970s). 2.70 mi. ; from US 113 northeast to MD 589. A recently bypassed part of old US 113. ~1.2 mi. (1937); east off MD 2-4 to end of state maintenance near Spears Rd. No longer assigned (decommissioned), number re-used for MD 575 above. 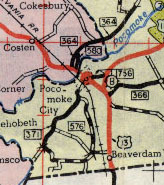 MD 575 (top), shown on a 1958 map. MD 576, shown on the 1948 SRC map. 3.70 mi. ; from MD 392 / DE 20 junction, Reliance northwest to MD 313, Federalsburg. MD 577 forms the line between Dorchester and Carolina Counties. 4.24 mi. ; from MD 331 east to MD 16. MD 579 · Bozman-Neavitt Rd. 7.84 mi. ; from MD 33 south to road end at Neavitt.